With all businesses, the vital part of making it work is having clients. Without clients, you have no work, and no work means no business! How you go about getting those clients can vary enormously. Advertising, sales calls, referrals and repeat business and so on all work but one of the most popular ways in the events industry is the trade show. 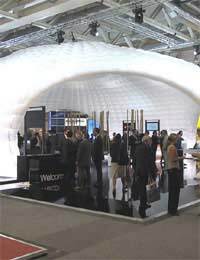 Within the industry there are a large number of different types of trade shows. Ranging from the huge international expo that seeks to generate global events and business, to smaller shows that target specific areas – say, entertainment, or food and drink. Trade shows can even be wedding fairs, which are excellent for smaller suppliers or wedding planners. Depending on what type of events business you have, you may decide to invest some of your money in one of these shows and it’s therefore wise to ensure you get the best from it. Getting the right space and making the most of it is vital with a trade show. A lot of them, particularly the bigger shows, are expensive. The stands are costly and you may find yourself and the staff you choose to operate the stand have to stay in hotels for the duration – plus of course you’ll need to eat which can cost a bomb at these shows. Not only this but you will inevitably be missing time in the office – and of course your time is money, and if you are using your own staff to assist then this means they are away from their work too. It’s not just the actual cost of the stand you need to consider but the loss of resources too. What you could be carrying out were you not manning a stand for umpteen hours a day! Because stands are expensive, you may find if you choose one of the larger shows that you will only be able to afford a small stand. It goes without saying that this will definitely have lower impact than having a larger space, so it might be worth talking to your suppliers, see whether they might be interested in sharing space. If not, and you decide to go ahead, try to negotiate with the show planner, see if you can have a say in where your stand is placed. Corners are always a good bet, or close to the eating areas works well! Using your own staff to man your stand might seem like the most cost effective way to operate but this might not be the case. What if they are junior team members with little experience, or perhaps the other end of the scale, they’re too valuable to take out of the working environment. An effective way of ensuring both areas are covered well might be to invest in experienced staff or specialists for your stand. There are many freelance event managers and certainly entertainers are easy enough to arrange. If you have a small stand, what better way to attract attention, than to have an eye catching performer drawing people towards you? And what better way to ensure that you get your message across effectively than to have experienced event personnel on hand to present your product or services to the stand visitors. You might perhaps draw on suppliers you use, or you could approach a specialist agency to help you with this. But it’s likely to be money well spent, although at the time it will feel just like additional cost!